People with allergies may find relief by using natural plant extracts and foods that act as antihistamines. Antihistamines are substances that block histamine activity in the body. Histamine is a protein that triggers allergy symptoms, such as sneezing, itchy eyes, and a scratchy throat. Over-the-counter and prescription antihistamine medications are effective for symptom relief, but they can cause side effects, such as drowsiness and nausea. As a result, some people wish to try natural alternatives. In this article, we describe the five best natural antihistamines, and we take a look at the science behind them. 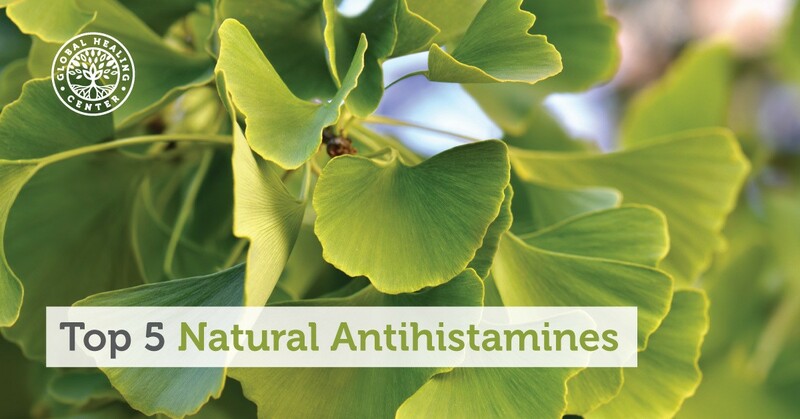 There are a number of natural antihistamines that may help relieve allergy symptoms. Vitamin C boosts the immune system. It also acts as a natural antihistamine. According to a 2018 study on vitamin C in the treatment of allergies, oxidative stress plays a key role in allergic diseases. As vitamin C is a powerful antioxidant and anti-inflammatory, it may act as a treatment for allergies. The researchers observed that high doses of intravenous vitamin C reduced allergy symptoms. They also reported that a deficiency in vitamin C might lead to allergy-related diseases. Another study from 2000 suggests taking 2 grams (g) of vitamin C daily to act as an antihistamine. Butterbur is a plant extract from a shrub that grows in Asia, Europe, and some parts of North America. People often use butterbur to treat migraines and hay fever, also known as allergic rhinitis. According to the National Center for Complementary and Integrative Health (NCCIH), butterbur may have antihistamine effects. A 2007 review of 16 randomized controlled trials, testing 10 herbal products, suggests that butterbur could be an effective herbal treatment for hay fever. This review suggested that butterbur was better than a placebo, or as effective as antihistamine medications, for relieving allergy symptoms. However, the authors of the review point out that some large studies received funding from industry manufacturers, and so further independent research is needed. Raw butterbur extracts contain certain compounds called alkaloids that can cause liver damage and cancer. Extracts of butterbur that do not contain these substances are available. However, no studies have looked into the long-term effects of using these products. The plant extract can also cause allergic reactions in people with sensitivities to ragweed, chrysanthemums, marigolds, and daisies. Pineapple juice contains the anti-inflammatory enzyme bromelain. Bromelain is an enzyme found in the core and juice of pineapples and is also available as a supplement. Bromelain is a popular natural remedy for swelling or inflammation, especially of the sinuses and following injury or surgery. Research on mice suggests that bromelain can reduce allergic sensitization and allergic airway disease thanks to its anti-inflammatory and anti-allergic properties. People who are allergic to pineapple should avoid bromelain. Probiotics are microorganisms that might offer health benefits by helping the body maintain a healthful balance of gut bacteria. Probiotics may boost a person’s immune system, which can help the body fight off allergies. The NCCIH say that the evidence for probiotics is mixed and that some probiotics may help while others may not. Quercetin is an antioxidant flavonoid found in many plants and foods. Research suggests that adding quercetin to the diet may help to relieve allergy symptoms. Research reports that quercetin can have anti-allergic and antihistamine properties. In one animal study, researchers found that quercetin could reduce the respiratory effects of allergies in mice by lowering airway inflammation. However, the evidence for its effectiveness is mixed, and according to the NCCIH, there is not enough evidence to suggest that quercetin can relieve allergic rhinitis. However, taking supplements of quercetin will work better in the treatment of allergies than eating foods that contain it. This is because foods contain significantly lower levels of the flavonoid. Quercetin is generally safe for most people. It may cause headaches and tingling in the arms and legs of some people. Very high doses, especially when taken long-term, may cause kidney damage. If natural antihistamines do not reduce a person’s allergy symptoms, they may need to seek alternatives. Allergy avoidance is typically the first line of defense against symptoms. Try to identify the allergen, which might be pollen, pet dander, or mold spores, and reduce exposure to it as much as possible. Allergy shots may be helpful for people with severe allergies. Allergy medicines can cause the immune system’s reaction to the allergen to calm down. Antihistamines work by breaking down histamine in the body. Antihistamine medications can reduce symptoms such as sneezing, itchy eyes, and sinus pressure. People with severe allergies may benefit from immunotherapy. This treatment is also suitable if allergy medications do not relieve symptoms. During immunotherapy, a healthcare professional will give a person a series of injections that contain tiny amounts of the allergen. This treatment may take place over several years and aims to desensitize the body to the allergen. For people with pollen allergies, doctors may recommend sublingual immunotherapy. This involves placing a tablet under the tongue until it dissolves. Those with severe allergies may need to carry an emergency epinephrine shot (Auvi-Q, EpiPen) with them at all times. Giving this treatment at the onset of an allergic reaction can reduce symptoms and may save a person’s life. Living with allergies can be challenging, especially when symptoms are at their worst. Seek help and advice from a doctor when dealing with allergy symptoms. Some natural substances can have antihistamine properties, meaning they can break down the chemicals that cause allergy symptoms. More evidence is needed to find out how effective these natural remedies are. For the best chance of relief, try to limit or avoid exposure to the allergen. Practice good self-care techniques and consider using natural antihistamines. As the United States Food and Drug Administration (FDA) do not regulate supplements, and natural remedies can interfere with certain medications, it is essential to speak to a doctor before beginning any new supplement or herbal remedy.